They say that if it is not on the first page on Google, it doesn’t really exist. Of course, it does exist, but obviously, this is an ironic way of depicting today’s society, which is so used to getting the information they search for right away, and wouldn’t even bother clicking on page number “two”. So, apart from advertising, how do you get on Google’s first page? How do you really stand amongst the cool guys, the winners, the ones who are seen first? The answer is Search Engine Optimization, also known as SEO. The world of SEO is complex and constantly evolving, and there are only a few digital marketing strategies that are as competitive as SEO is. It is a challenge for small business owners and SEO experts alike to be ahead in the SEO game all the time, as there are over 200 ranking factors that affect Google’s algorithm, and they constantly change shapes, become prominent or fall into decline. If you have an online business and want to stay ahead of the competition, you will need to keep track of future trends in digital marketing, including SEO, no matter whether you have a website plugin that takes care of it, or you have hired an in-house SEO professional. Without further adieu, let’s help you up your SEO game this year with the following list of SEO trends that will dominate 2018. A little bit more than two years after Google’s introduction of RankBrain, it is becoming a more and more important factor in shaping Google’s search algorithm. In 2016, Google announced RankBrain as it is considered to be one of the most important ranking factors. Google’s parent company, Alphabet has invested a lot in machine learning and Artificial Intelligence (AI) to an extent where all search queries are processed by it right now, as opposed to only 15% at its introduction. So, what is RankBrain? Although it sounds like a cool nickname of a superhero, RankBrain is a machine learning system that helps Google filter out search results and ranks them accordingly, based on how users interact with them. RankBrain is not only able to analyze user behavior on SERP (Search Engine Results Page) but also manages to comprehend relationships between topics and queries. Here is an example: if you search for “evening makeup”, it will show you a bunch of YouTube tutorials on how to put on evening makeup at the top of the page, followed by blogs with tips and ideas of evening makeup, as opposed to offering you where to buy evening makeup. This is because RankBrain would assess billions of similar queries and see how many users would click on similar results, thus trying to respond to the user’s intent and needs first. Needless to say, the more time people spend on your website and the more people click on your link from SERP, the more Google will reward you and the bigger chances you will have of appearing higher on SERP next time. The influence of RankBrain is getting bigger every day, and what you can do about it is focus on quality and comprehensive content, and not so much on keywords, but on the user’s intents and needs. With more than 50% of searches being done on mobile in 2017 (source: Statista), and a little more than three hours a day spent on mobile by Millennials as of 2016, mobile is becoming more and more important in people’s lives. It is a means of getting information fast and on the go, and probably the reason why Google has switched over to a “mobile-first index”. Mobile-first index means that Google would consider the mobile version of your website as your primary version. The Google bot would first crawl your mobile version and then go to the desktop one, and if your site is not mobile friendly, this will negatively affect the rankings on both your desktop and mobile sites. The mobile-first feature isn’t live just yet, but it will be a good thing to consider and prepare for it, especially if you want to stay ahead of your competition. Make sure your website (products, images, and videos) are loading fast on mobile for a better user experience and some additional love from Google would follow. A cool and easy tool to quickly check whether your website is mobile friendly is Google’s Mobile-Friendly Test Tool, it even gives you tips in case you are missing something important. Moreover, you can check the loading speed of your website by Google’s PageSpeed Insights and make sure that it works fast on mobile devices. Today, videos are devoured at a faster rate than we will eat our popcorn while binge watching our favorite series on Netflix. As a matter of fact, by 2021, global video traffic will account for 80% of all traffic on the Internet (Source: Cisco). And although according to YouTube, mobile video consumption rises by 100% each year, this trend will only increase with time. Users turn to search on YouTube more frequently than ever before. In fact, YouTube is too big of a search engine to ignore, so if you are looking to grow your traffic in 2018, you might as well consider creating and optimizing video content for YouTube. According to SmallBizTrends, companies, which create videos enjoy 41% more web traffic than those who don’t. If your videos serve their purpose well, you will get more traffic, more leads and potentially more sales. You will also get more space on SERPs for your SEO optimized YouTube videos, meaning your results will be more prominent, increasing your chances of getting that click to your website. With every day, more and more people start using voice search. Once you try, you kind of get addicted to the ease of using it. Consider Google’s reports where 55% of teens and 40% of adults use voice search daily; and, according to Google’s Director of Conversational Search – Behshad Behzadi, the percentage increase of voice search is growing at a faster pace than type search. Our busy lives and constant need of things ‘on the go’, such as coffee ‘on the go’ or food ‘on the go’ has led to the inevitable need of information ‘on the go’ that is so kindly offered by voice search. Although voice search is still at a very early stage, it is a good idea to start optimizing for it now. If you want to be successful with your efforts, consider this – the results from voice search usually are the results from featured snippets. And if you want your content to be featured in a featured snippet, it is important to obviously rank well organically and create text-heavy and well-structured content that users would love and respectively Google will award you for it! The average SERP doesn’t look like it used to before. Armed with a whole pack of featured snippets, Knowledge panels, local packs and so on, there are more than one ways to increase the clicks towards your website (your Click Through Rate /CTR), apart from the obvious – being number one on the search results. 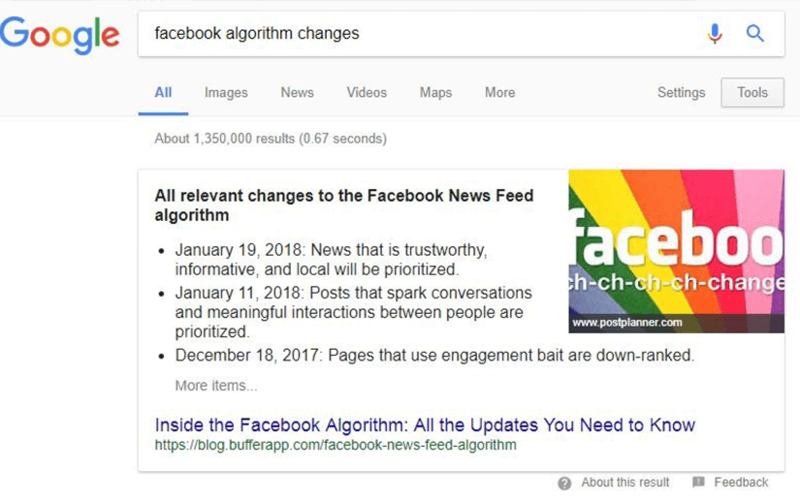 If in the past, it looked like an endless list of blue links, now SERPs look much more refined and make it easier for you to skim and find the information you need. 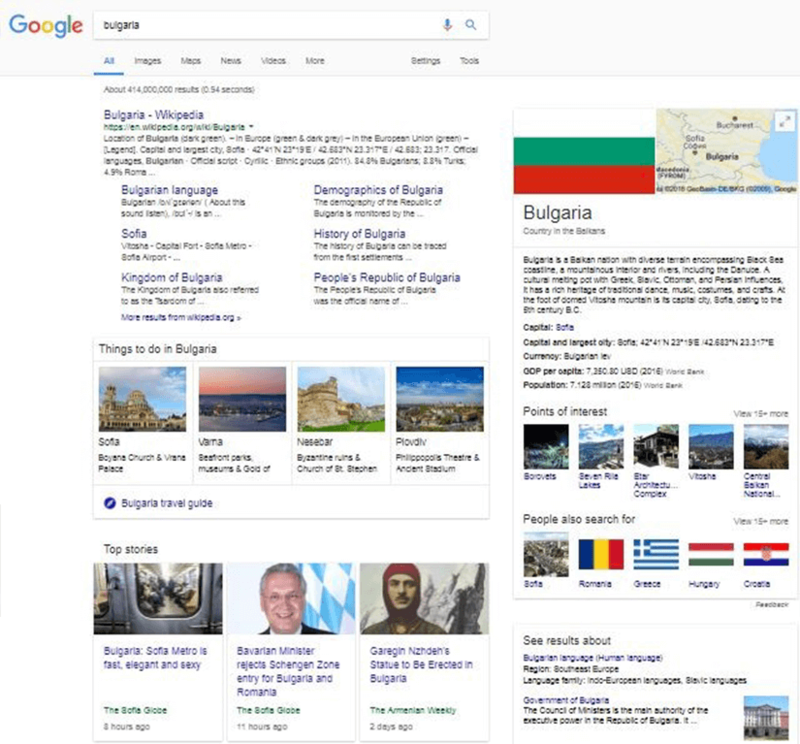 SERP is constantly getting new updates and is more dynamic than ever, so why not take advantage of all the features it offers to make your business stand out? And as Shelly Fagin, Founder of Highly Researched very accurately says: “Getting the number one spot on Google doesn’t hold the same value we fondly remember from the past.” Now it is important to focus on the user’s experience and provide them with the comprehensive information that they are looking for. SEO in 2018 is much more than a pack of well-researched keywords, but about comprehensive content, context and focusing on user’s intent. Have you started optimizing for any of the above SEO trends? If so, we would love to hear where you are focusing your SEO efforts in 2018 and what results are you aiming for?